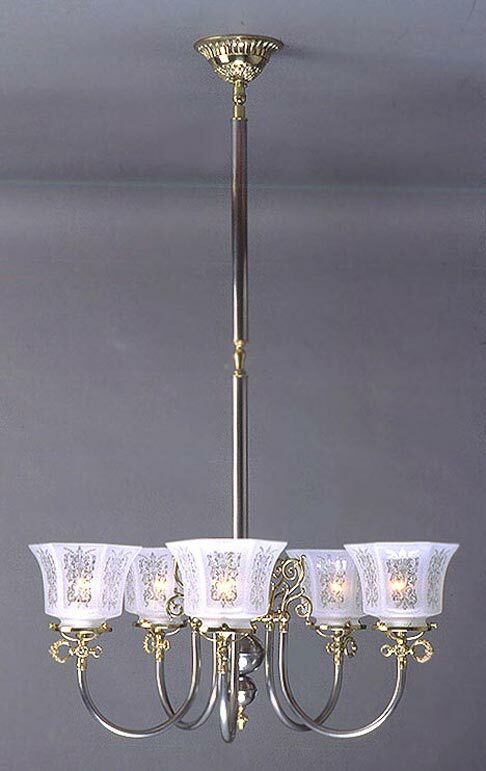 The 'U' arm series continues with this upward facing pewter, gas light reproduction gaslight chandelier, dressed to the nines with polished brass jeweled accents. A very country look, perhaps from a formal French eatery late 1800's. White frosted hexagonal acid etched shades complete the package. Consider a custom matching "U" arm wall sconce to match? Same metal, same glass, same holder, same back plate, etc. Coordinated lighting fixtures is what we do best!